We’ve all been there. Invited to a wedding of someone we know casually and unsure about bringing a gift. Maybe their a friend, but not a close friend. Or it’s your best friends wedding, you’re in the bridal party and they got you the most amazing gift for you own wedding, but you’re on a budget. What then? 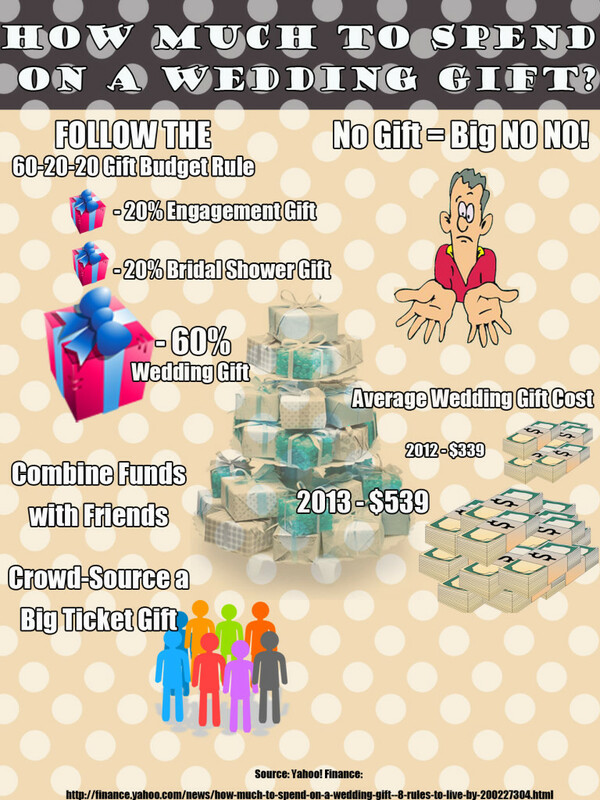 Yahoo and the Knot.com teamed up to help make wedding gift spending easy and we broke it down into a simple infographic. Rose Gold Blooms in Spring! It’s spring time! Which also means that it’s allergy season. Pollen is in the air from all the flowers that have sprung. But what else is in the air? It seems that couples are tying the knot left and right! Why is it that people seem to fall in love and take the plunge more often in the spring? Scientifically speaking, it’s because of dopamine. Many educational and scientific articles state that spring allows more dopamine to be produced than in other seasons. Dopamine is responsible for reward-drive learning and a trigger for wanting new experiences. In spring, everything is new compared to winter: new colors, new smells, more outside activities, and even seeing more skin. This triggers the desire for more dopamine, which also gives us a good indicator as to why spring is regarded as the season of love (or at least first and new loves). The season of love also happens to be wedding season. With the snow melting away and plant life reviving itself into bloom, spring is the perfect time for couples to hold their ceremonies and receptions. The weather is beautiful and guests are generally more available due to spring and summer break, as well as holidays. Gorgeous scenery deserves equally gorgeous decor and jewelry, specifically, rose gold. Rose gold jewelry is rising in popularity within the fashion and wedding industry. Its unique color and shine make it one of the most sought after precious metals for spring weddings. Rose gold is widely used as an accent color for jewelry, such as this stunning tungsten ring with rose gold and silver inlay. Rose gold can also be a flattering jewelry option for brides walking down the aisle. A small necklace with a rose gold hearts adds a nice touch of elegance to any dress. This spring, whether you find yourself feeling all giddy inside saying I do or just contemplating where to plan your 1st date, remember that it’s probably the dopamine from all of Spring’s magical effects. Either way, make the best of the most enjoyable season of the year while looking good! Ah, Valentine’s Day: A day where men show their unconditional love for their better half by shelling out money to buy precious gifts like jewelry, overpriced roses, chocolates, fancy dinners, and extravagant getaways. What recipient wouldn’t want to be spoiled with these gifts? According to recent polls, women rated fancy gifts fairly low and would rather spend more time with their love. Even among young girls and newly weds, the dollar amount a man spends on a gift isn’t very important, but rather the amount of time he spent making or choosing the gift. At Tungsten World, we understand that not every gift needs to be the flashiest or the most expensive. It just needs to be from the heart. Rather than just get her any ring or necklace, why not personalize it with your anniversary or an inside joke? All of our tungsten and cobalt rings come with a laser engraving option, along with select pendant necklaces. New jewelry is always nice, but personalized jewelry is even better! If you literally need a gift connected to time, then a watch is the perfect option. The watch is the least common gift men give to women, but can be perceived as a thoughtful one if given for the first time. The beautiful selection of watches at Tungsten World come in various designs and materials, such as tungsten, ceramic, stainless steel, and carbon fiber. Best part is that they are affordable jewelry, so you’ll have some money left over for the actual dinner and festivities.